Last Sunday instead of walking to the gym, James and I decided to try the Melbourne Bike Share bikes. Actually the original plan was to have tried it the week before, but when we went to the 7-11 to pick up helmets they didn’t have any available. The bike station at the Melbourne Uni gym has a helmet vending machine so after we walked to the gym we picked up 2 helmets ($5 each, but returnable to a 7-11 for a $3 refund). 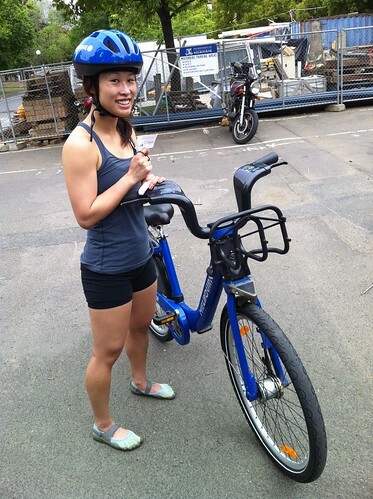 Then the following Sunday we swiped James’ credit card at the Queen Vic Market station and picked up our 2 bikes. It was $2.50 each for the whole day – it would have been more if we’d kept the bikes for longer, but the ride to the gym was under 30 minutes so it was free. It was a good route because it consisted entirely of riding on bike/pedestrian shared footpaths. Unfortunately I was too short for the bike, even with the seat all the way down. Embarrassingly enough on the way there I needed James to wheel me along at the start because I couldn’t push off with the giant bike. I get extremely nervous when I can’t even touch the ground on tippy-toes, and the back wheel made a particular whirring noise that kept tricking me into thinking another bike was tailgating me. I was pretty much in a state of mild panic the whole time, and my death-grip on the bike handles meant that when I arrived at the gym my forearms were killing me. This was me on the way back. Is that how helmets are supposed to sit? It looks like a blue mushroom on my head. I regret that we didn’t get any action shots because I think I looked adorable perched on the huge bike. Despite being downhill, the ride back was less stressful than the ride there. Maybe it was because I was more mentally prepared for the giantness of the bike. Maybe it’s because I was braking the whole way home. Overall I don’t think I’d repeat the experience – I’m not against riding bikes but I wasn’t a fan of these ones. It didn’t save any time because we had to backtrack a little to get to the bike station, and it took time to get the bikes set up and put them back when we arrived at the gym. Plus $5 is okay to spend as a novelty, but I wouldn’t want to pay that every weekend for no real benefit. I’m glad I tried out the Melbourne Bike Share though, because I learned that the bikes aren’t really suited for my transport situation. I also learned that the bikes aren’t short-people friendly. Oh yeah, and I learned that Kalo saw me riding the bike and laughed for 10 minutes. At least he didn’t see James wheeling me along at the start like a parent teaching his kid how to ride a tricycle. It’s not as evident when I’m not sitting on it! James found the bike acceptable for his build, but neither of us thought it was particularly comfortable. 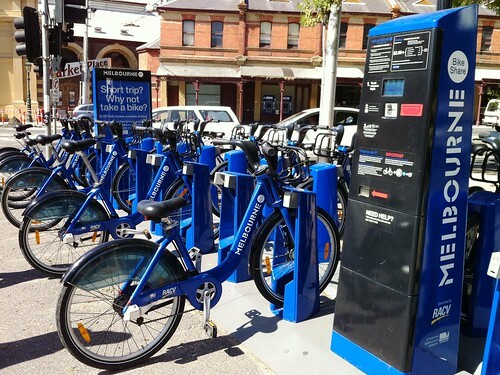 Who can use the Melbourne Bike Share system? I’m 1.6m (though I do have short legs for my height). I guess that although I’m technically tall enough to ride the bikes, they are slightly too big for comfort, resulting in a less than optimal experience. Though, I haven’t been on a bike since. And the left leg still occassionaly gives out. I’d like to go riding again though, but maybe I’ll stick to the trails and bike paths…! OMG your leg still gives out? That settles it, I’m never riding on the roads! Oh, just in that it buckles slightly sometimes. Rarely even! It’s fine, really! SHOULDN’T HAVE EVEN MENTIONED IT!! hey key… did you happen to miss all of the HOSPITALISATIONS and BROKEN LIMBS at the last panpacs? Those are from freak accidents though! Whereas everyone I know who rides a bike has had either accidents or multiple near-misses with cars. Finally someone with an unbiased review of the bikes. Must have been somewhat terrifying not able to touch the ground with the feet on the bike, that must sucked. I don’t like feeling precariously balanced on the bike. I’m sure other people like the Melbourne Bike Share, but it’s just not for me I think!